Still in the process of eating down the freezer (I am hoping to get enough room to fit a deer once Engineer gets a chance to go a huntin') and you know what I have found? Cheese. That's what I have found lurking in the frozen abyss that is my freezer. Lots and LOTS and LOTS of cheese. I need to cook something with cheese in it. It's the right thing to do. The only problem, which is not really a problem as much as a consideration, is that we have started getting our boxes from our CSA (Community Supported Agriculture) share and so I have to plan my menu around that and cheese doesn't always go with winter veggies. Although I have a small person in my household that would strongly defend the premise that everything goes with cheese. By the way, if you get a chance, look at what I have to say about the new Carmex lotions. You might get a chance to try them out for yourself! 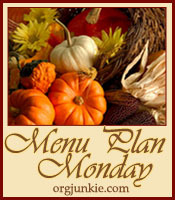 For menu ideas or just a looksee, head over to Organizing Junkie's Menu Plan Monday. We love Carmex too! I bought a big "Sam's club" package last year, and now I have some in some form in my purse, bedroom, bathroom, living room, and just about every coat pocket I own! Eggplant Parmesan is the only way my kids will eat eggplant which is such a shame since I absolutely love it.